DIAMOND BAR, CA (January 6, 2015) – Featuring more than $30,000 in aftermarket parts and accessories, the SEMA Cares 2015 Jeep Wrangler that debuted at the recent SEMA Show is set to be auctioned at Barrett-Jackson in Scottsdale, AZ, on Wednesday, January 14. The auction will mark the seventh vehicle developed for SEMA Cares, a committee established by the SEMA Board of Directors that brings the voice and resources of the SEMA community together to make a positive difference in the lives of others. More than $1 million has been raised since SEMA Cares was established in 2007. 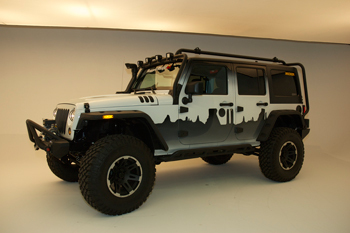 The SEMA Cares 2015 Jeep Wrangler is set to be auctioned at Barrett-Jackson onWednesday, January 14, 2015, at approximately 8:00 pm Eastern Time/5:00 pm Pacific Time. The Lot # is 3001. Additional details: www.barrett-jackson.com or contact Mike Spagnola at mikes@sema.org; 909-978-6707.